Once upon a time there were two sisters, very close in age. The oldest was very prissy, loved pink, chocolate, and anything frilly. The other, quite frankly, preferred to run naked through the house giggling like, well, a little girl. One day, their mother said, "Let's get our pictures taken today." So, they got all dressed up, gussied up their little brother, too, and headed for the picture place. They waited, sitting patiently during all the hoopla (for a little while, at least) and while their brother was hamming it up for the cam. Their grandmother, with her knowing eye, could spot two little girls who were on the edge of distraction. See? Ah. Yes. Flip flops. Jeweled flip flops. 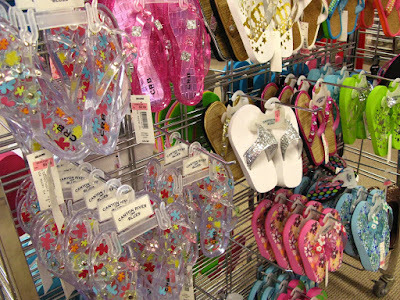 Rhinestoned flip flops. Gel flip flops. Flip flops with gold stars. Sigh. 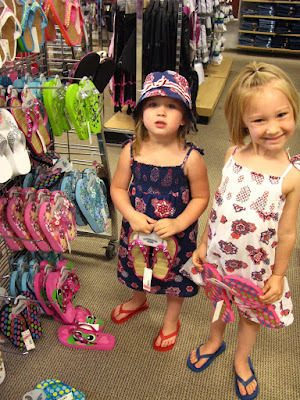 "Oh, grandmother," the sisters said, "We just love flip flops...."
The grandmother could hear the cash register ringing in her ears. "We like these!" they chimed. Who could resist those faces? 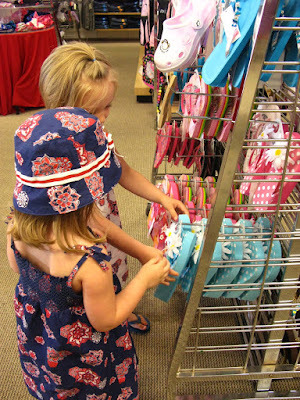 The grandmother, now starting to inspect the tags and count her pennies, glanced at the sister's feet and said, "But you already have flip flops!" "But we need more! And these are so pretty!" the girls told her. 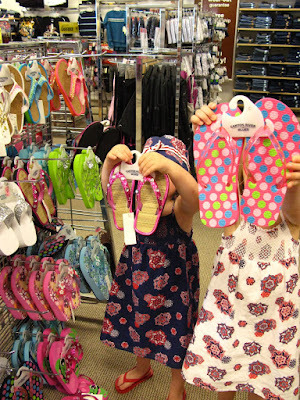 And the grandmother almost caved, until the girls' mother arrived with their little brother, glanced once at the beautiful and sparkly array of flip flips on the rack, the smiles on her daughters' faces, and the shoes in their hands, and said to the grandmother, "Don't let them con you. They have a large laundry basket full of flip flops just like those at home." Sigh. The grandmother would have parted with her pennies anyway, except the mother was not in the mood to discuss any further. It seems, that taking three young children to get their pictures taken is a tiring event. But oh, the end product can be just precious. They are so cute! 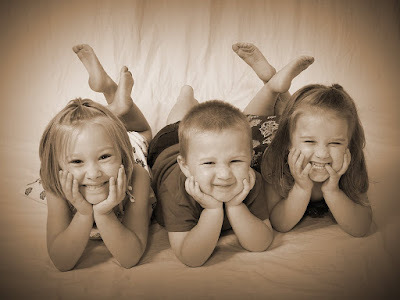 Being a grandma myself, I know exactly how easy it is to be taken in by those beautiful smiles and sparkling eyes. What little dollbabies!!! 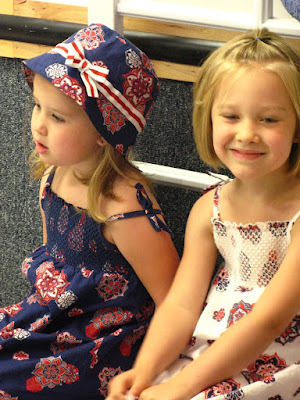 They're adorable, Maddie!!! Thanks, you guys. It's great when they present me with photo op material. Lucky for me I carry my camera with me everywhere I go! Tracy, yes, a HUGE handful. No wonder my daughter stays so thin! Yes, Maddie. Thanks for sharing! What a great story! I know you loved the day! They are so cute, but then again, you already knew that.